In honor of another fantastic New Orleans’ Saints season as well as the 2013 Super Bowl being held in the Superdome once again, we are paying tribute to the greatest players to ever wear a Saint jersey. Though Darren Sharper only played two seasons for the NFL Saints, in those two years he accomplished more than most of his predeccors could have even dreamed of. During the 2009 season Sharper set many Saints’ franchise records that will most likely stand forever. These include the longest interception returned for a Touchdown (99 yards) and most interceptions returned for a touchdowns in a season (3). As well, he set an NFL record after getting 9 interceptions with a cumulative 376 return yards (record). He as well was one of their most dominant defensive players when they won the Super Bowl. After being drafted in 2001, he became the first Saint to rush for 1,000 yard in three consecutive seasons. Though his career was cut short due to injury, McAllister went to two Pro-bowls, earned two All-pro selections was a member of the Super Bowl XLIV championship team and as well is the New Orleans Saints All-Time leader in rushing yards (6,096) and touchdowns (55). He is widely considered one of the most influential Saints of all time. “The Dome Patrol” refers to the reign of 4 linebackers (Vaughn Johnson, Sam Mills, Rickey Jackson and Pat Swilling) who all played together from 1987-1994. During their tenure the Saint’s earned their frist ever play off birth, and made the playoffs four different times. Furthermore, they earned one division title and led the NFL in points allowed in consecutive seasons (1991-1992). They tallied 27 games of allowing 10 points or fewer and posted 5 shut-outs over the 7 year career they all shared in New Orleans and as well, all 4 were selected to the 1992 Pro Bowl; making them the first linebacking corps in history to do so. The #2 overall selection of the 1971 Draft, Manning was undoubtedly the greatest QB in Saint’s history, that is until our #1 came to town. He played with New Orlenas for over 12 season and accumulated 2 pro-bowl selections as well as an NFC Offensive Player of the Year award in 1978. He is largely considered the first player to bring the Saint’s to the national stage by his playing abilities. Drew Brees has been playing with the Saints since 2006 and since then has been two four Pro-Bowls, a Super Bowl MVP and champion, twice named the NFC MVP, AP Male Athlete and Sportsman of the year in 2010, and is the All-Time single season passing yards leader as of last season with an unbelievable 5,476 passing yards in the 2011-2012 NFL regular season. More importantly though, Drew was the face of the entire city of New Orleans struggle, and eventual conquering of the effects of Hurricane Katrina. 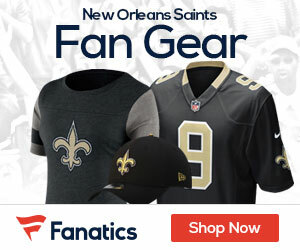 For the best deals and biggest selection of New Orleans Saints Tickets, visit Big Will Tickets!